Headlined “After killing spree, is a free press Mr Duterte’s next victim?”, the NY Times editorial said: “Even among that cast of illiberal leaders who rouse mobs with their ruthless policies and disdain for democratic protections, President Rodrigo Duterte of the Philippines stands out for his viciousness. The NY Times described Rappler as a “tenacious critic of the President’s vicious crackdown” and this had led to the government announcing on January 15 it was revoking the online news site’s licence. Media freedom watchdogs say the Philippine Securities and Exchange Commission (SEC) has produced no hard evidence to support its “foreign ownership” in breach of the constitution accusations against Rappler and the company that owns it, Rappler Holding Corp. Rappler is challenging this SEC ruling through the courts. Philippine Ambassador to the US Jose Manuel “Babe” Romualdez denied any “political motivation” behind the SEC ruling on Rappler. In a letter to the editor published by The NY Times on January 24 in response to the editorial, Romualdez described SEC chairperson Teresita Herbosa as “a person of unimpeachable character”. Rappler and many supporting news groups staged “Black Friday” demonstrations across the Philippines on January 19 when chief executive Maria Ressa declared her organisation would “ hold the line” on press freedom, insisting journalism was “not a crime”. “We’re doing journalism. We’re speaking truth to power. We’re not afraid and we won’t be intimidated,” she said. 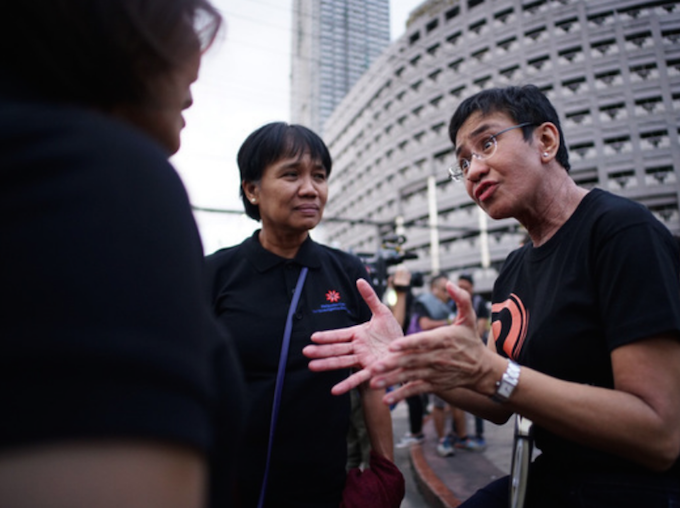 Ressa has joined a group of courageous, outspoken and defiant women opposed to Duterte who are “being marginalised, silenced, or worse”, according to The Diplomat. They include Vice-President Leni Robredo (effectively gagged and whose office will be eliminated under Duterte’s controversial “federalism” plans) and Senator Leila De Lima, a human rights advocate (jailed for the past year on trumped up charges that have yet to be tried in court). Ressa founded Rappler in 2011, originally on Facebook (now 3.6 million followers), after being CNN’s leading Asia investigative journalist for several years. 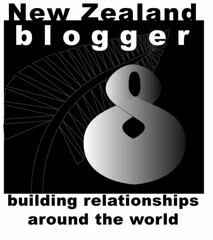 It has been a highly successful and innovative online and “citizen journalism” website, with an Indonesian edition and the slogan “independent journalism with impact”. Rappler currently faces a “cyber libel” complaint that is seen as highly dangerous for the media. Duterte has also threatened to block renewal of ABS-CBN’s franchise – the largest and most influential television network in the Philippines and publicly criticised the Philippines Daily Inquirer for its alleged “slanted reporting”. (A Duterte crony, San Miguel beer baron Ramon Ang, then seized a majority ownership stake in the company). 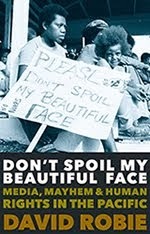 University of the Philippines journalism professor Daniel Arao said the President’s criticism echoed the martial law era, when then dictator Ferdinand Marcos ordered the shutdown of media outlets that were critical of his regime. “The Duterte administration is being creative in terms of harassing and intimidating the media, but there is also the brutality, the bullying and the crassness,” Dr Arao said. Other media freedom advocates have also warned that the Philippines is sliding into its “darkest chapter” of Philippine history between 1972 and 1986. Describing the government’s stance as a “flagrant” violation of press freedom, the Paris-based Reporters Without Borders watchdog announced it had asked the United Nations, UNESCO and the Association of Southeast Asian Nations (ASEAN) to take a stand. In a joint statement on Thursday, the three UN special rapporteurs said they were “gravely concerned” about the government moves to revoke Rappler’s licence. “Rappler’s work rests on its own freedom to impart information, and more importantly its vast readership to have access to public interest reporting,” said the rapporteurs. The rapporteurs are: David Kaye (Special Rapporteur on the promotion and protection of the right to freedom of opinion and expression), Agnes Callamard (Special Rapporteur on extrajudicial, summary or arbitrary executions), and Michael Forst (Special Rapporteur on the situation of human rights defenders). Writing in The Diplomat, University of Portsmouth academic Dr Tom Smith warned that journalism in the Philippines “has long been a dangerous trade, one that carries a very real risk of murder with little likelihood of accountability”. He reminded readers of the 2009 Maguindanao massacre when 58 people, including 32 journalists, were shot and “hacked to death, allegedly by members of the Ampatuan clan”. There had been no justice so far for the victims so far in a flawed prosecution case that has crawled over the past decade. This is why so many people are concerned for the future in the Philippines with the news that Duterte’s administration is trying to ban Rappler. 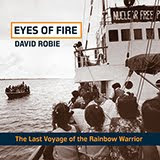 Dr David Robie is editor of Asia Pacific Report, published by the Pacific Media Centre.